The upcoming round 11 , of the AFL Home and Away Matches , is the Indigenous , " Dreamtime " , Round . Clubs are producing specially themed football jumpers , to celebrate the huge indigenous contribution to AFL Football . 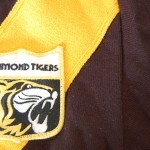 Striking , decorative , a feast of aboriginal mark makers , these unique football jumpers , jerseys , guernseys , will be worn with pride by all players . They can be purchased from clubs now , and are destined to become collectors items . Its a novel concept , the wearing of art adorned footy jumpers . Tommy Hafey , inspirational AFL Footy Legend ,was buried earlier in the week , in a moving ceremony at the MCG , surrounded by his beloved Richmond Football Team . This entry was posted on Friday, May 23rd, 2014 at 10:09 am	and is filed under AFL, football jumpers. You can follow any responses to this entry through the RSS 2.0 feed. Both comments and pings are currently closed.